A civil lawsuit has been filed against an off-duty Los Angeles police officer who discharged his weapon during a filmed confrontation with a bunch of school children, prompting protests. 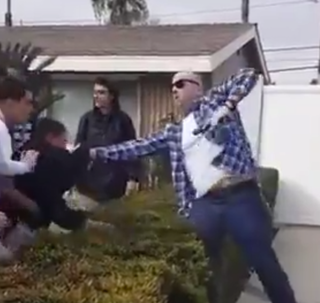 According to the Los Angeles Times, Christian and John Dorscht filed the complaint against Officer Kevin Ferguson last week on behalf of the parents of one of the teenagers involved in the Feb. 21 confrontation. There’s a brief back-and-forth between the teens and the officer. Another teen attempts to separate the struggling pair, but another boy then runs up and pushes the officer into and over a low hedge. The boy who tried to separate the officer and the 13-year-old appears to hit Ferguson, which is when Ferguson reaches into his waistband, pulls out a gun and fires. No one was hit by the gunfire. The 13-year-old boy was arrested on suspicion of making criminal threats and battery, while a 15-year-old was also arrested on suspicion of battery. Both, however, have since been released, according to the Times. Ferguson was not arrested and remains on duty, although he is not working in the field, an LAPD spokesman told the Times. According to the Times, the incident is still under investigation by Anaheim police, while the LAPD is conducting a separate internal inquiry. The L.A. Police Commission will make a determination about Ferguson’s decision to open fire. The Los Angeles Police Protective League, however, which represents officers like Ferguson, called the suit a “shakedown” in a statement released Wednesday. Because firing a weapon on a group of teens because they walked on a lawn is totally an appropriate response and will definitely teach them right from wrong.